Do You Have Club News ? Do you have club news that you would like to get posted on the District blog? Maybe a notice of a club anniversary, or a story about a donation to a youth project, or a club community service project, or a story to recognize a deserving club member. Does your club run a website with a blog? You can also email a link to a specific article to optinews@amsnwoptimist.org. We will do our best to get your club news posted to the District blog as soon as we receive it. The top row of faces are past District Governors Debbie Ettleman, Lee Weiszhaar, Bert Hancock and Les Rogers. The bottom row of faces are past District Secretary-Treasurers Lyle Merriam, Ron Eaket, Gary Cross and Mike DeMarco. Here's another interesting question ... of those past District Secretary-Treasurers, how many have also served as past District Governors? Have you guessed yet? It's three ... Lyle, Gary and Mike also served as past Governors. Knowing our history is an important hallmark of respect to those individuals and their families who donated a year of their lives and hundreds of hours of their time to serve all the members of this great District. I invite you to take a tour of our Past Governors (www.amsnwoptimist.org/past-governors.html) and our Past DSTs (http://www.amsnwoptimist.org/past-district-secretary-treasurers.html). We have a really good idea of who served in which positions, but we do have a few holes in our records, so we need your help to fill in the blanks. We currently have photos for 22 serving and past Governors but only 16 serving and past DSTs. We are also looking for the names of who served as a past DST for the years 1991-92 and 1973-74. Our thanks go to Duane Kelly who helped to compile an almost complete list of past DSTs. Thanks also go to Ron Eaket who provided his photo and helped to correct some mistakes with the past Governors list. Finally thanks go to Betty Jewison who provided a photo of he husband, past Governor Glenn Jewison; and to Mike Flaherty who supplied a photo of his father, past Governor Jim Flaherty. If you can provide a photo and/or supply the missing names, please contact Optimist Gord Welling (District Web Services Special Projects). After hearing from several members who work closely with the deaf and hard of hearing community, Optimist International will now allow a new CCDHH topic as an acceptable revision to the current topic. 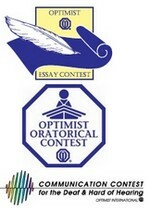 Both topics will be accepted for the 2012-2013 CCDHH Contest only. This will not affect the Oratorical Contest in any way. Canadian clubs recently received an email that indicated that the Optimist Canada International network of club websites is suffering extreme difficulties and clubs should switch to creating their own website at www.wordpress.com. This notice does not affect any Optimist Clubs outside of Canada. U.S. clubs can disregard this announcement. This notice is about the generic club websites that were built for each Canadian Optimist club. Those websites were typically hosted as http://clubname.optimistcanada.ca. That announcement has no affect on any club websites that you have built on your own. Clubs can continue to use their existing websites and facebook pages ... you do not have to make any changes to what you already have. Most Canadian Optimist Clubs will have this generic optimistcanada.ca website link in the Club Directory hosted at www.optimist.org. Each club should check their website link on the Club Directory and email nicola.delia@optimist.org if you need the website link changed. Use wordpress.com - this requires some WordPress expertise to configure it and use it. 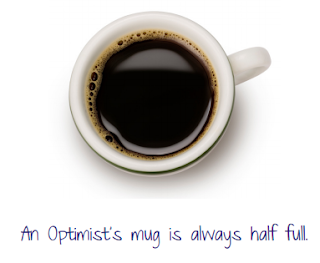 St. Albert Breakfast Optimist Club - I highly recommend weebly.com. Clubs can use our "Contact Us" form if you need help or have questions on building a club website. If the kids in your local subdivision are bored, lack anything interesting to do, or want to do something that will make a difference ... please take the time to encourage them to learn about opening a JOOI club. Teachers ... are you looking for a "club" that will foster a sense of volunteerism in addition to teaching valuable problem solving and team work skills? Youth from across the U.S. and Canada have started their own "Optimist" clubs under the JOOI program so they can server their community. Most kids are looking for a way to give back if they can and if it's cool. The JOOI program gives those youth the opportunity to build their own club ... from the ground up .. they raise their own funds ... they decide what projects they will design and deliver ... and they create a energetic "Optimistic" presence! Contrary to popular belief among many school principals, JOOI is not a leadership program ... JOOI is a community service club that offers each youth the opportunity to lead, follow, particpate, communicate, and foster their imagination. JOOI is made up of four types of clubs: Collegiate Clubs for full-time undergraduate students, Octagon Clubs for high school students, Junior Optimist Clubs for junior high students, and Alpha Clubs for elementary-aged youths. The 20,000 members of JOOI elect their own president and four-member board of directors which also includes the immediate past president. Each JOOI Club is governed autonomously, with its own local leadership. By keeping that leadership local, JOOI Clubs empower young people to make positive decisions to serve fellow youths and their community. By encouraging involvement and awareness of local issues, JOOI Clubs cultivate the leaders of tomorrow. 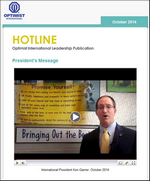 The future of Optimist International is with our youth. If we can give them the opportunity to excel beyod their wildest dreams they will jump at the chance. Our future leaders and members will experience the energy and satisfaction of creating and running their own club and will carry that success to adult clubs when they are ready. Get the youth ready to propel Optimist International into the future ... help build a youth Optimist Club today. 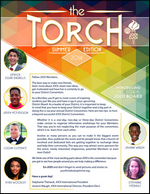 Are You Interested in Sponsoring a Youth Optimist Club? Contact our New Club Building Chair - Opt Glen Kreller and visit our Clubs 4 Kids web page for more details and links to resources to get you started. Have you heard about the latest idea in recruiting new members for your club? It's as simple as a cup of coffee ... literally. That's what it involves; just inviting a friend or a neighbor for a cup of coffee, or tea, or milkshake (whatever strikes your fancy). Invite - Extend an invitation to "coffee" and be ready to pick up the tab. Enjoy a coffee and Listen - Begin to build a relationship by taking the time to ask questions. Share stories about your club and how they can have an impact with community service projects to help kids. Engage - let your guest know about an upcoming project and invite them to participate. Once your guest meets your fellow club members running an activity ... you'll often hear a question about how to become more involved. Download the Coffee Recruitement Program brochure to get more ideas. "How Can I Help My Friends Realize Their Value"
"Why My Voice Is Important "
You are invited to the 2nd Quarter District Board Meeting scheduled for Feb. 1-2, 2013 in High River, Alberta (just 37 km south of Calgary). Enjoy the hospitality of the Optimist Club of High River, at the Hertiage Inn Hotel and Cenvention Centre. Registration Details: Register before Jan. 4, 2013 for early registration prices of $100/$90 Member/Companion, otherwise add $20 for late registration.